The Merwede bridge on the A27 between Gorinchem and Sleeuwijk was days away from collapsing in a potential repeat of the Morandi bridge disaster, experts told current affairs programme EenVandaag. 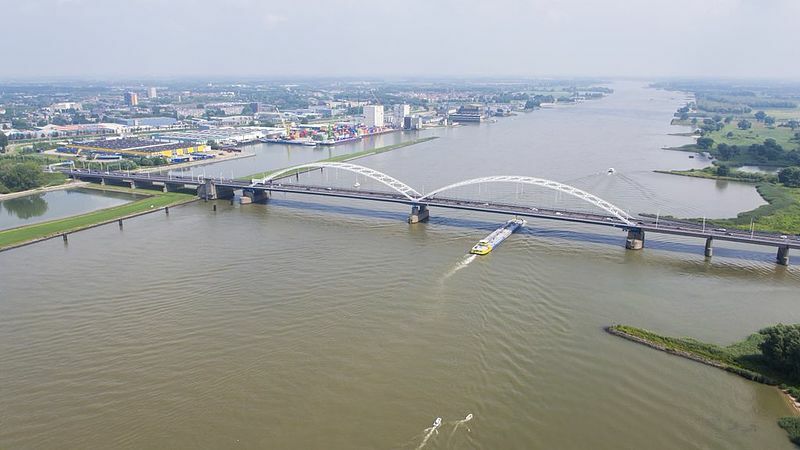 Delft University professors Rob Nijsse and Ben Ale based their conclusions on a report on the state of the bridge by advisory agency Berenschot. In October 2016 the Merwede bridge was suddenly closed to heavy traffic because the bridge structural supports were found to have hairline fractures. ‘That means the bridge is a write-off and that it is a miracle it is still standing,’ Ale told EenVandaag. In December the bridge was deemed safe enough to allow heavy traffic to use it again. Ale said the Netherlands escaped a disaster on the scale of the collapse of the Morandi bridge in Genua in Italy last year which killed 43 people, and that the bridge was just six days away from giving way. The report calls into question the quality of safety controls of bridges in the Netherland, Ale told EenVandaag. ‘Perhaps sometimes a fatal accident is necessary to get the message across,’ he said.